Six colors: Three blue, two red and white. The basic pattern for the hearts used in the middle of the square pattern can be found at Skip to my Lou. It's been adjusted a little to fit the square. I love winter but these faux blossoms make me long for springtime. and the flag of the country he is learning to love. 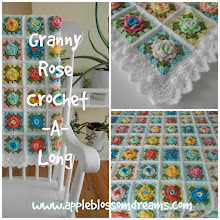 The leaf pattern is from the Easy Makes Me Happy Blog and the apple blossom and rosebud patterns are from Lesley Stanfields, 100 Flowers to Knit and Crochet, book. This wonderful book was purchased via Amazon; however, the apple blossom pattern can also be found on the Lion Brand Website. Now it's time to finish the rainbow scarf before the weather warms up. I don't want it to have to wait until next fall to wrap it's lovin' fibers around someones neck. The yarn seeds that have been planted for a master bedroom afghan. 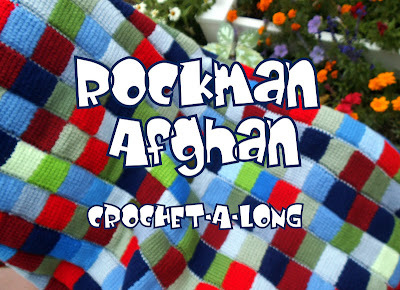 The yarn lays upon the bed on which the afghan will someday lay. The plants have arrived, now all they need is a plan and some fertilizer. I have plenty of fertilizer, but the plan is the problem. 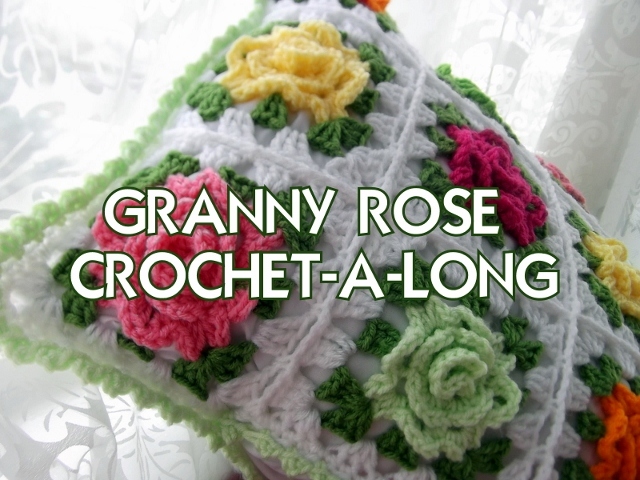 A granny square that incorporates hearts would be ideal. These are a few of the ideas I have toyed with but nothing seems to click. I'm still experimenting...Suggestions? There's a cookie I am famous for....well...does having one HUGE fan (the NVO) constitute "famous"? It's a Norwegian Christmas cookie and it's called berlinerkranser ("Berlin Wreaths" or "Little Wreaths" depending on who you ask). The NVO calls them the "J.C. Cookies", he knows in his heart that they must be J.C.'s favorite cookie. I tell him (the NVO, that is) that J.C. likes wine and fish, not berlinakranser, but the NVO has his own theory. If the NVO's theory is correct then I have two HUGE fans. Although these are a Christmas cookie, I know I can make the NVO feel especially loved if I make them during other times of the year. This Valentine's Day he received heart shaped berlinerkranser and I received a brand new apron that I had been observing and dreaming about through the window of a lovely local shop for the past few weeks. I think they go very well together. I will share this recipe with you in the event that you ever are in the company of either one of these two wonderful gentlemen. *The Norwegians use something called pearl sugar (IKEA), it looks like Margarita or pretzel salt, but it's not - it's sugar. Additionally, I used red sprinkles for V-day. The NVO loves non-pariels and, they come in many colors for any occasion but some pretty pastel colors for Easter will be nice. For You NVO...Happy Valentine's Day!!! Ice Fishing with the NVO is a Dream That Comes True Every St. Valentine's Day Weekend! 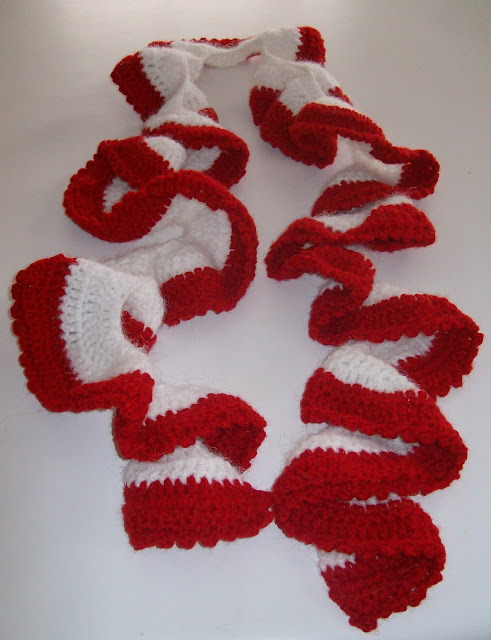 Perhaps these "hooked" neck warmers will entice the fish to get "hooked." The neck warmers were thoughtfully made to coordinate with our fishing attire. I would love to embellish these with some small crocheted rainbow trout. Does anyone have any ideas or patterns? This year bring on the wind!